Worthing Football Club is set to officially open its newly upgraded main stand when the team takes on Harlow Town on Saturday. The stand has received extensive upgrades over the summer, with £45,000 invested over the course of six weeks of work. The newly upgraded stand provides 450 seats for Worthing fans and in addition to the new seating, the re-development of the main stand includes upgraded press box with WIFI connection and power supply; new sound system introduced to the ground; new glass balustrade; new cladding installed on the roof of the stand and additional spot lighting. Worthing chairman George Dowell said: “The new stand has undergone an amazing transformation over the course of six weeks of hard work. 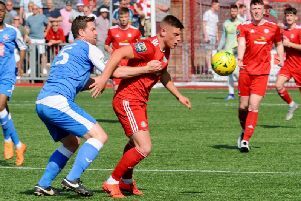 It is the latest step in the growth and ambition of Worthing Football Club and really makes the club feel at home as we kick off the new season in the Ryman Premier League. Bibby Financial Services, the UK’s largest independent invoice finance provider, helped support Worthing through a three year £25,000 agreement, allowing the re-development to take place. As part of the agreement, the stadium now takes on the name of the “Bibby Financial Services Stadium”. Commenting on the new stadium name and its support for the club, Nick Carter, head of sales – South London, Bibby Financial Services (BFS) said: “Worthing FC is a club that we have been supporting for a number of years having previously sponsored the north stand. We are delighted to take our support for the club further by sponsoring the whole stadium.